With the expertise of our skilled technicians, we are able to offer a wide range of Paper Cutter Machine that is available in standard sizes. These are ergonomically designed as per the latest industry requirements and are appreciated for its smooth working, low noise operation and low maintenance. A4 Paper Trimmer prescribed use The trimmer is designed for the creative cutting of paper, film and other suitable soft materials. 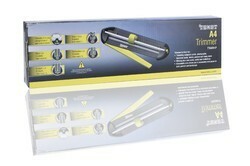 The Trimmer has 4 Blades, Straight Cut, Perforated, Wavy, and Score. The Straight and Perforated Blades allows you to cut 5 Sheets at once whilst the Wavy Blade cuts 3 sheets at the same time. The Score Blade will slightly marked the Paper allowing you fold the paper in an clean and accurate manner. The Trimmer has an extendable arm which allows you to accurately trim paper in both portrait and landscape. Safety instructions In case of any damage caused by the failure to observe these operating instructions, or any improper use or operation, or the failure to observe the safety instructions, then the guarantee for this product, will be invalid. Do not use the cutting head to carry the trimmer. Do not overload the Paper trimmer. Do not insert more sheets or stronger sheets than stated in the Technical data. Do not touch the edge of the blades as they are very sharp! Please keep this operating manual for further reference! If you pass this device on to third parties, please forward this operating manual as well. Operation Do not cut hard material such as metal strips, glass etc. Always operate the device with both hands. Use the device on a stable, flat and even surface only. Before each cut please check that the Blade in the cutting head is secure. 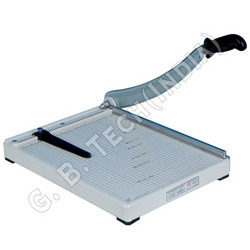 z Place the Paper Trimmer onto a non-slip surface. z Push the cutting head to the top of the ruler. z Place the material to be cut under the cutting ruler and bring it into the required position. z Press the cutting ruler onto the material and with one hand, hold it in place. z Now, pull the cutting head in a constant movement and with slight downward pressure along the cutting ruler. Instruction on how to Change the Blade Remove the Yellow Clip from one end of the Trimmer, (marked with an arrow pointing up). Slide the Metal Bar forward through the slot where you have just removed the yellow clip, until the other end of bar comes out, lift the bar slightly then slide back and remove bar completely. Slide the old Blade off the Bar and replace with a new Blade. To replace the Bar, slide through the hole then push the other end of the Bar back into it’s original position and then replace the yellow clip. Trimmer is now ready to use again. A potable A3 guillotine trimmer, ideal for making those final alterations to any notice, poster or document. Ideal for offices, schools, copy shops or print houses, make sure your laminated media is properly trimmed using this fantastic product. 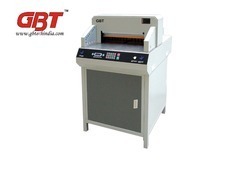 Our wide range of A3 18 Inch Heavy Duty Paper Cutter Machine is designed as per the latest industry requirements. These are tested to ensure that the products are free from defects. The range is manually & electrically operated and is known for its precise cutting, easy operation and low power consumption. 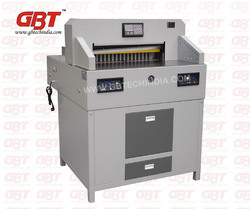 Cutting capacity: especially for PVC Also suitable for cutting thick/strong paper, card, etc. Straight cutting, perforating cutting , wave cutting. 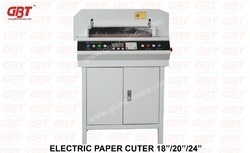 This machine adopts rocking-turn pressing paper and uses lever-cutting to make cutting easily and convenient. 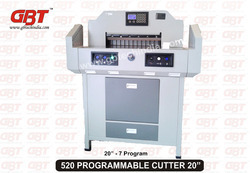 Cutter chooses excellent steel and the hardness is up to the international standard. The base molding by one time and looks very beautiful. The slice is durable, operating easily and cutting smoothly. 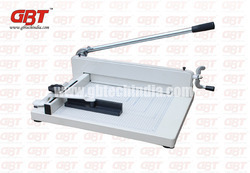 We manufacture a wide range of Electric Cutter machine that is available in A4 & A3 sizes. These are designed as per the latest requirements of the industry and are tested to ensure their flawlessness. Our range is capable of cutting papers within a short interval of time and provides a neat look to the papers. These are appreciated for their low noise operation, power saving capacity and easy installation. Graceful appearance, concise design. beautiful and practical. 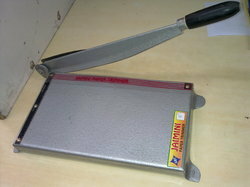 Half-cutting blade : 12; Perforating blade: 1; Rubber wheel: 2. Different pressure to different kinds of cutting materials, solve spring-press precision not high, improve efficiency. High speed, force and thickness, make the max thickness up to 50mm, meet different cutting need. direct viewing operational signal, error alarms, be clear at a glance, convenience and fast. CE standard, two hand operation, infrared wall protection, air breaker protect etc. 2. Independent clamp technology ensures perfect cutting precision. 5.LCD display, self check system, find the problem quickly. 7.The cutting depth and size calibration can bu adjusted by setting the program. 8.Double lead screws for pushing paper plate form without siot design, to make the pressure more equal and improve cutting accuracy. 9. Inclined blade cutting technology. We take pleasure to introduce ourselves as the renowned manufacturer, exporter and supplier of Programmable Paper Cutter. 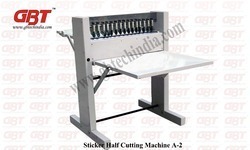 The provided machine is ideal for any kind of cutting requirements. 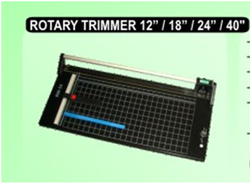 Manual paper cutterSize 9" / 12"/ 18"/ 24"/ 32"
Rotary Trimmer, 12", 18", 24", 40"